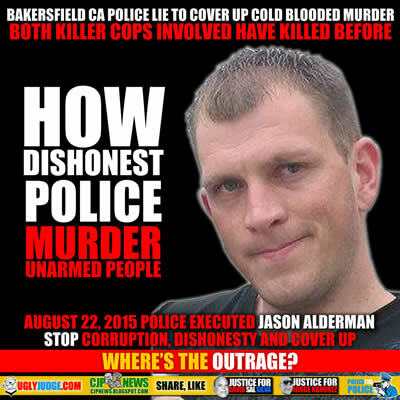 Police execute Jason Alderman August 22, 2015 and lie about it. Attorneys for the family of Jason Alderman, the man who was shot and killed back in August, has filed a civil right claim against the Bakersfield Police Department. The Bakersfield Police Department has been caught lying about the existence of video surveillance at Subway. What lies will BPD tell the public and the media today? The Alderman family was compelled to retain the Geragos firm based on the numerous lies being told by BPD to the press such as being told by police that Jason was killed for reaching into his waistband and then telling the press a different story. Immediately, the Geragos firm identified the existence of surveillance at the location and learned from employees that BPD took the footage immediately after the shooting. After being called out for its lie, BPD now admits it lied, claiming however it was “mistaken.” BPD purports to have the video under lock and key. The Alderman family has completely lost trust in BPD investigating itself. Meanwhile, the Kern County District Attorney which previously purported to be conducting independent OIS investigations – although it was exposed as being completely collusive with BPD with its own track record for tampering with evidence — has shown its true colors again by letting BPD engage in the same lies and cover-up tactics. It was previously reported that one of the officers involved in the death of Jason was Officer Chad Garret who was also involved in the death and attempted cover up of BPDs unarmed informant Jorge Ramirez in September 2013. We now learn that the other officer involved in Jason’s death was Officer Rick Wimbish who was also involved in the death of Jorge Ramirez and the BPD shooting death of the unarmed 22-year old James Villegas Delarosa in November 2014. This is Officer Wimbish’s third OIS death of an unarmed young male in as many years. BPD has lost all credibility, lacks transparency, and has already tainted this investigation.